1. It is recommended that you have your car detailed every three (3) months so as to maximize its protection. 2. A monthly wash to your car is the minimum recommended frequency. However, we recommend washing weekly or bi-weekly. We are more than happy to offer hand washing and monthly maintenance programs to make it easier for you to keep up with your car. 3. If your car has been recently painted, ask the body shop if it was baked or not. If the paint was baked, the paint can be waxed in just a couple of days. Otherwise, experts say you should wait anywhere between three (3) and six (6) months before waxing. 4. Leather conditioning is essential to keep in and replenish vital oils in the leather that prevent stiffness and cracking. We recommend conditioning in between details and it’s never too early to start conditioning your leather! It is also important to treat all vinyl inside the car to prevent sun damage and to keep interior components looking new. A: Automatic car washes are unsafe for your car's paint. They use harsh chemicals that strip the wax and protection from your car, and the brushes will cause scratches in your car's paint called "car wash marks" or swirls. Why should I bother having my car detailed if I am selling it? You don't get a second chance to make a first impression! Showing a clean, well detailed vehicle to a potential buyer will speak volumes about you, and show that the car was taken care of and not cosmetically neglected. You can also add hundreds of dollars to the value of your car by having it properly detailed before you sell it. According to Kelly Blue Book, the front-runner in used car values, the following cars have substantial differences in value between cosmetically flawed and cosmetically sound. This data was collected in April of 2005, and all vehicles have been compared with the same relative features and mileages (40,000 mi). Only trained staff members who have completed our Quality Assurance Program Training will service your car. Our teams are especially proud of repeat customers' requests for the same team that has worked on their car(s) before. 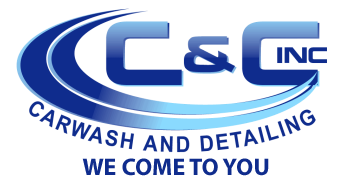 What does C & C Carwash and Auto Detailing do to protect the paint on my vehicle? We use a two-coat procedure, where the 1st coat is a polish and the second coat consists of pure carnuba wax. This enhances the shine and durability of the wax. Typically, between 3-4 months (compared to many other waxes that last 1-2 months!). We suggest a wax every 4 months. We offer affordable wash maintenance programs in between waxing, but if you'd prefer to do it yourself, we strongly suggest using detergents that are made to help keep wax on vehicles -- no dish detergents! Only use a clean, wool mitt and always chamois dry your vehicle. My local carwash offers detailing at half the prices of most professional detailer services, what is the difference? This is a very good question! First of all the term 'Detailing' has been widely misused in the industry. A true detail consists of meticulous cleaning; professional swirl free polishing and protection of surfaces. Many carwashes simply cover dirt with shiny greasy solvent-based dressings. This not only traps the dirt inside but the solvents in many of these dressings actually damage the surfaces. Also, many inexperienced workers will run a hi-speed buffer over your paint causing damage and those ugly swirls on your paint or waxing over deep imbedded dirt. Make sure you ask many questions before allowing anyone to detail your car. When I bought my new car, the salesman told me I have a clear coat on my paint and it NEVER needs waxing. Is this true? FALSE! This is simply one of the most misunderstood and incorrectly stated ‘facts’, detailers see. The fact is 'clear coat' is simply part of the paint system used on most cars and trucks manufactured since the early 1990's. This paint process consists of first painting the color (pigmented paint) that goes on flat without any shine, protection or durability. After the color has been added, clear urethane paint is added to make the finish hard and glossy. Older (pre 1990's and some newer) paints consist of a single stage paint, where the gloss and hardness is mixed with the color (pigment). Today’s clear coats simply make the paint look much more translucent with a deeper shine. Fact is, both paint systems MUST be waxed or sealed to protect them from the sun, pollution and other harmful elements. See also the question about paint sealants. My dealer added a paint sealant and said my car will never need waxing again, is this true? Once again FALSE! This is one of the biggest marketing hypes we have ever seen! This is truly a play on word, meaning that 'sealant ' (which does last longer than wax) still needs to be re-applied every three to six months. Hence the statement “never waxes again” simply means sealant rather than wax must be applied again. If you paid the dealer for this coating you will find that the contract requires you to have this re-applied at specified periods to maintain the warranty. Waxing is a completely safe alternative, but only lasts about a month (spray on wax from a carwash may only last about a week). Advanced Auto Detail uses a top of the line polymer paint sealant that will last 3-6 months. Buffing and waxing is the same thing aren't they? Actually no! Waxing is simply a protective element that is applied to the paint surface. While waxing may help add some shine to the paint, it should not be confused with buffing. Buffing is a paint correction process that utilizes a hi-speed rotary buffing machine. This process is used to remove superficial scratches, blemishes and fading of a paint surface. The process consists of starting with a 'cutting compound' used to aggressively remove the damaged paint surface. Several polishing steps to smooth and restore the finish to a hi-gloss slippery finish follow this process. Unfortunately no. While pre-treating and steam extraction (part of our service) is the most effective cleaning procedure available, some spills (especially any with reddish dyes), can actually damage and dye carpet and upholstery fibers. Once this occurs, these fabrics can be cleaned, but color change is permanent unless material is replaced or re-dyed. We typically invoice once the work is complete and payment is accepted upon pick up or delivery of your vehicle. All major credit cards accepted. Are touch less car washes okay for my car? No, the chemicals in touch less car wash are even harsher and will put your paint at risk. Why do I need wax or a polymer sealant on my car? Wax and sealants are the only way to protect your vehicle's finish. Rain, acid rain, snow, sunlight, bugs, tar, road grime, pollen, and bird droppings can all eat through your paint. Keeping your car well protected will reduce the chances of these elements harming your car, while providing a glossy finish and shine. Having your car waxed or sealed is no less important than changing your oil. My car's paint has a clear coat - do I still need wax? My car is new. Do I still need it detailed? Absolutely! New cars have usually been sitting on the lot or have been in transit for months before you drive away with them. New car dealerships rarely carry out full details on new vehicles, so there is a plethora of contaminants in your car's paint. Having your new car detailed will start you off on the right foot and ensure there is a proper layer of wax or sealant on the paint. Can I have my car polished but not waxed? Polishing your car is what brings out the depth, gloss and shine for that "wet look" that most car enthusiasts crave. However, polishing adds no protection to your vehicle and in fact, usually strips any previous coat of wax on the paint. For this reason, it is absolutely essential that the car is waxed or synthetically sealed after polishing to "lock in" the polish and protect your car, yielding long lasting protection and shine.